The Complete Maui Experience! Book with us and receive complimentary discounts to restaurants and activities such as Duke's, Hula Grill, Kimo's, snorkel gear, Whale Watching, Snorkel excursions and tons more!! Unit 815 is an 8th floor oceanfront one bedroom with a king-size bed in the bedroom and the living room has a queen sofa bed. You will enjoy having two bathrooms. The unit serves four guests very comfortably. The kitchen is fully equipped including refrigerator with icemaker, stove, dishwasher, microwave, toaster, drip coffee maker, blender and all kitchen utensils. Also included for your convenience is salt and pepper, spice rack, plastic wrap, foil, baggies, napkins, paper towels, toilet paper, Kleenex, dish soap, hand soap, dishwasher soap, laundry detergent, shampoo/conditioner (small starter bottle) and hair blow dryer. All linens are provided including extra bedding and towels. Also available for your use are beach towels and a cooler. The unit has two flat screen televisions with remotes, one in the living room with a DVD player and the other in the bedroom. A stereo is provided in the living room with CD player and docking station. Central air conditioning, washer/dryer, iron and ironing board and extra hangers all make your stay more relaxing. The tiled lanai is spacious with patio table and four chairs. The unit is approximately 1056-sq. ft. and the interior is decorated in Hawaiian motif. An important feature to consider when booking your trip to Maui is the owners, Ben and Evie Leland live on Island and are there to assist you should you need anything, or if there is any concern regarding your accommodations. Many owners who rent, live on the mainland which can potentially create problems if there is a need for assistance. **If your dates are not available for this unit, please email or call me for a referral! ** We also have units 114 and 717 at the Mahana, vrbo #'s 193906 and 195801, available!!!! Ben & Evie Leland live on island, retired and enjoy giving back to their community. They are proud owners of 3 condos at The Mahana and a Kaanapali Vacation Home. They were both in construction for over 30 years, have 5 children and 13 grandchildren. One of their daughters, Alicia (with Visit Maui Beach), is their booking agent while Ben manages the properties. Alicia lives in Seattle Washington and has 5 children. We love our small family run business, our properties are amazing, very well kept and we offer over the top customer service. Our unit 815 is not only gorgeous, it offers 2 bathrooms and it literally steps from the beach! You will not find another condo as close to the beach as units at the Mahana, it really is a hidden oasis! The owners live on island and close by should you need anything and/or the unit needs attending too. We love what we do and offer excellent customer service. Our reviews speak volumes! We look forward to you joining our family. Mahalo! Plenty of towels provided as well as toilet paper. A shampoo and conditioner small starter bottle provided for you. Spices, sugar, zip lock bags, foil, etc. Tennis courts on property for guests use, bring your rackets! From the booking process to the moment you enter 815 you will know you have made the right decision in booking this unit. Alicia, the booking agent, is the best I've ever worked with and there have been many. She is professional, personable, attentive to your needs, quick to respond to your emails or phone calls and dedicated to making your stay in 815 meet your expectations and more. If there is a problem, concern, or question, Alicia or the owners, Ben and Evie, who live on Maui will provide assistance, guidance or answers quickly. Everything listed in the description of 815 and more is absolutely what you will find. We have never in 11 years of staying at other units, except when we stayed in Mahana unit 717 also owned by Ben and Evie and managed by Alicia, been provided for the length of our stay with so many extra supplies that you really don't need to buy anything at the grocery store except your food and personal products. Finally, the first thing you will notice besides the amazing view out of the floor to ceiling windows is how clean the unit is; even the artificial plants are dust free. They have hired excellent housekeepers and the unit shows that it is well maintained and the owners are focused on creating a comfortable living space for their guests. We have finally ended our search for paradise and will continue to enjoy our winter escape in Mahana unit 815. Property is just great! Nice view and close to everything...perfect location! We were on the 8th floor with a beautiful view of the ocean. The owners have the condo well stock including lots of household products. This is really a top of line unit. I highly recommend the Mahana condo, specifically #815 managed by Alicia. We have stayed at this condo previously and booked it with the hotel/front desk so we knew it was absolutely perfect. I've learned...always book with VRBO and specifically with Alicia. AMAZING views, great location, nicely decorated. Sunset from our lanai were breathtaking. Couldn't have asked for a better stay. We will be back for sure! This was our second stay in this very well-maintained condo. We stayed here for a week in 2015. We liked it so much we stayed here two weeks this time. The property manager, Alicia, is excellent to work with, as is the owner. They are very good communicators and very responsive. The condo is ideally located on the eighth floor so you are just above the palm tree line with an unobstructed view of the ocean and the islands of Molokai and Lanai, which makes for wonderful sunsets, which you can enjoy from the spacious lanai. The condo is nicely furnished and comfortable. It has a fully functional, well-equipped kitchen. There is a large flat screen tv in the living room and a smaller flat screen tv in the bedroom. Quality linens and towels are provided. The extra bathroom is a great bonus. 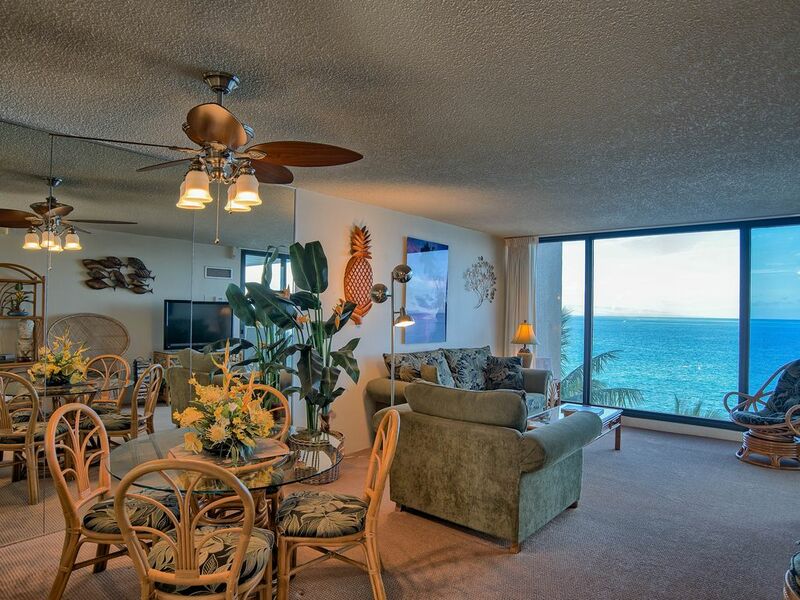 This condo and the Mahana twin towers make a perfect home base for just relaxing or for exploring Maui. We have come to Maui for the last 12 years. We have stayed at Mahana for the last 4 years. We stayed in Unit 815 for this trip and we loved the unit. All units have an oceanfront view that cant be beat! This unit offered 2 bathrooms which was a plus while traveling with a teenage daughter. Alicia, the property manager was great to work with and went out of her way to help us feel most at home. I would definitely consider staying at this condo again. Great location, wonderful fully stocked condo with a great view of the ocean. Can't imagine a better unit!